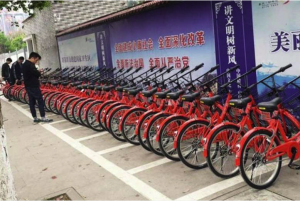 A bicycle-sharing company in China, Wukong Bike, has become the first to shut down after 90 per cent of its bicycles went missing, just five months after it started operations. The company, based in south-western city Chongqing, issued a statement last week, saying it was ceasing its services from June and withdrawing from the industry. Founder Lei Houyi told Chinese news channel NTDTV.com on Tuesday (June 20) that his failure cost the company more than a million yuan (S$200,000). He said the company had 1,200 bicycles in Chongqing, half in Chongqing University city and the other half in the city. However, a large number of them have gone missing, and only about 10 per cent can be located, he said.